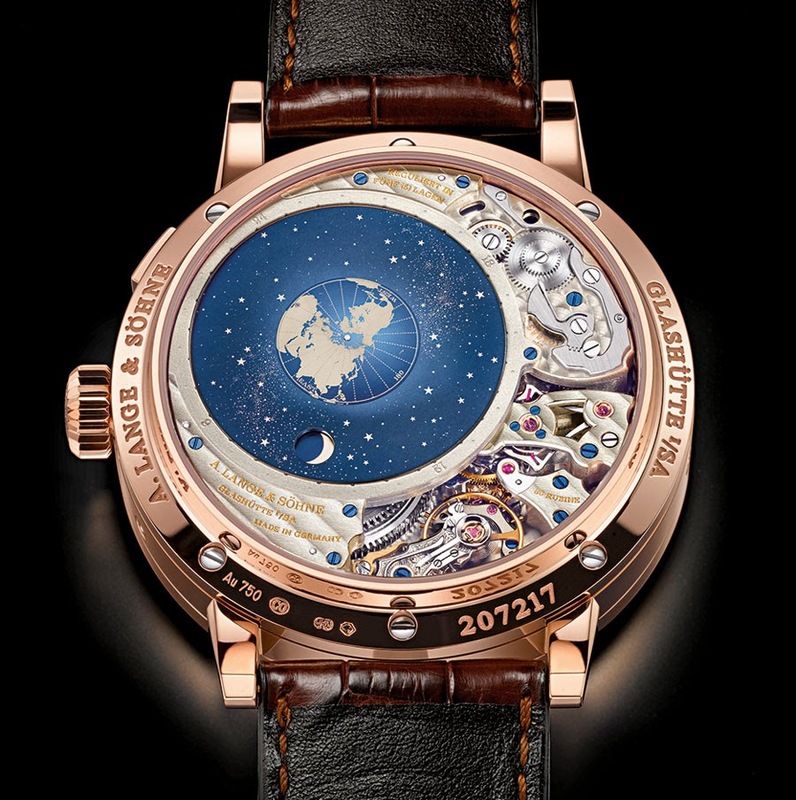 Probably the most impressive new watch seen at the SIHH 2014, the new A. Lange & Söhne Richard Lange Perpetual Calendar Terraluna features an orbital moon-phase display, a perpetual calendar with the signature Lange outsize date, a power-reserve of 14 days, and a constant-force escapement. Both sides are remarkable but the back brings the real surprise. 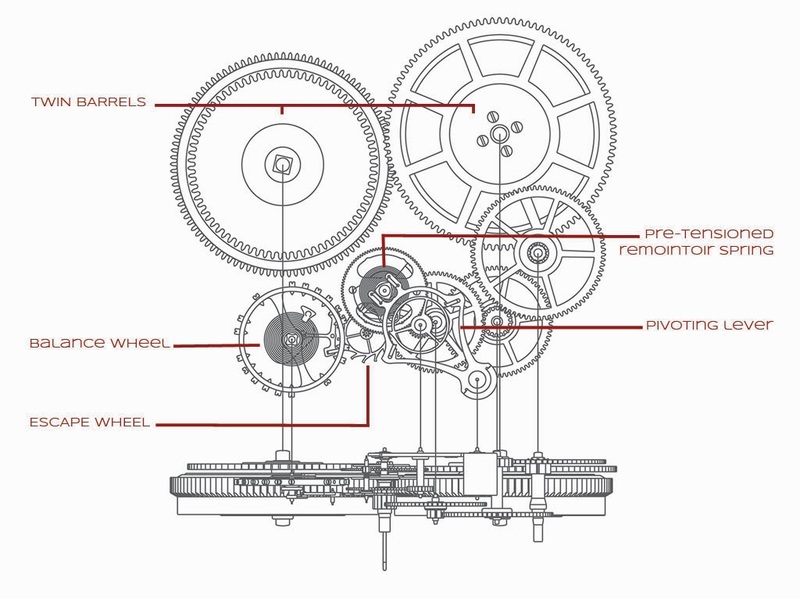 On the dial side of the pink- or white-gold case, we find the regulator layout typical of scientific precision watches. 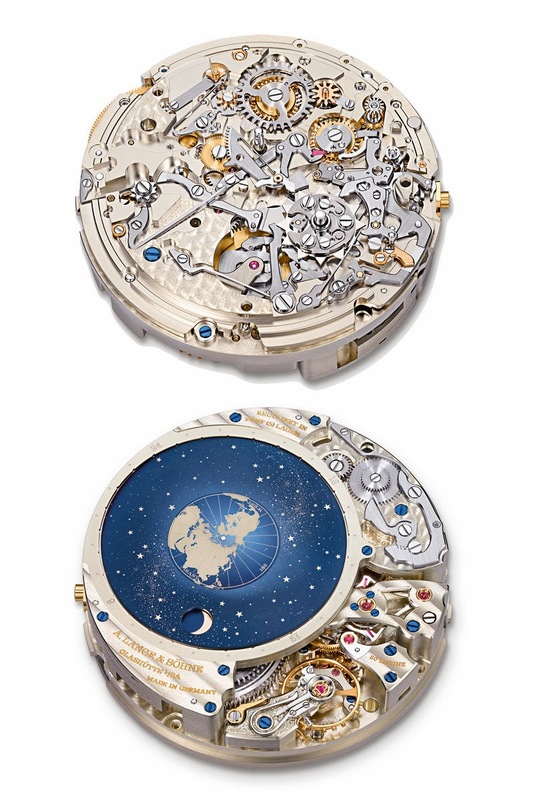 The movement side displays an innovative orbital moon-phase display that depicts the constellation of the earth, moon, and sun. 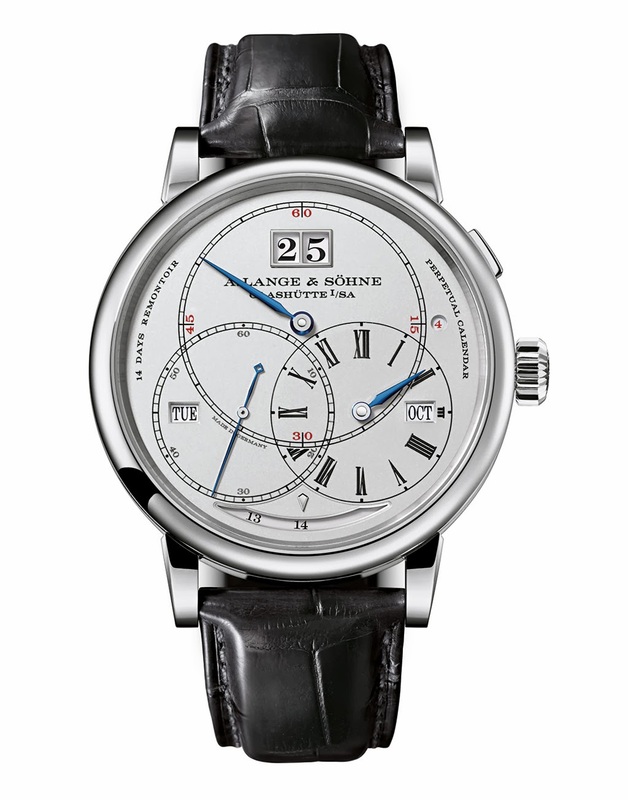 The minute circle at the top dominates the main dial of the Richard Lange Perpetual Calendar Terraluna while the smaller circles indicate hours and seconds. Beneath the characteristic Lange outsize date, two smaller apertures show the day of the week on the left and the month on the right. 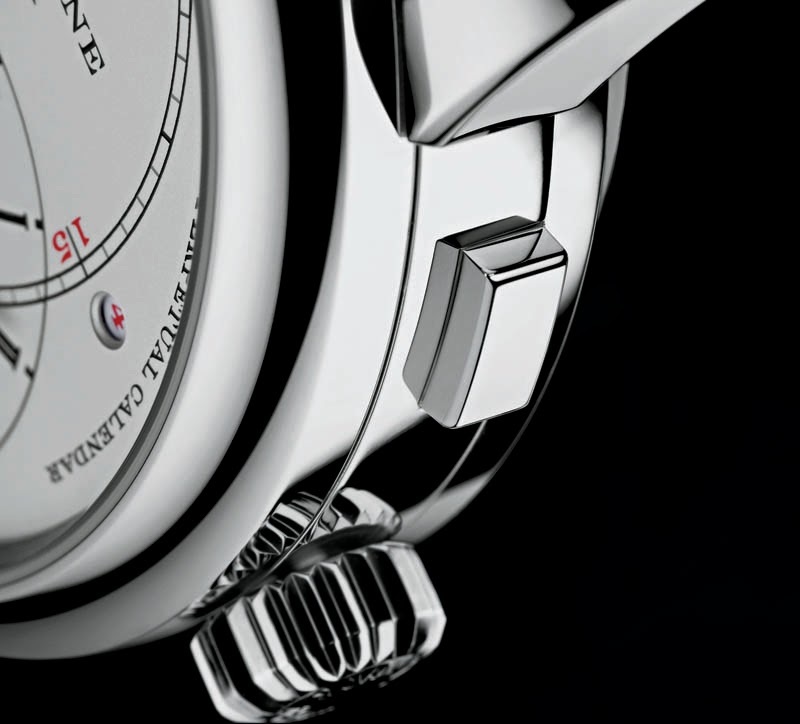 At 6 o'clock, the power-reserve indicator reminds the owner when the time has come to wind the movement. The calendar is mechanically programmed to correctly display the different durations of the months in a year as well as those in leap years until 2100. The leap-year indication is located in a small round window on the right-hand side. To keep the power for the switching process as low as possible, the required energy is gradually built up via a cam and then released instantaneously at midnight. The push-piece at 2 o'clock advances the calendar displays, while recessed push-pieces on the other side allows to separately correct month, day of the week and moon phase. On the back, the patent-pending orbital moon-phase display shows the location of the moon relative to the earth and the sun. This is a first time for a wristwatch. The display consists of three discs. On the star-studded celestial disc, the moon – visible through a round aperture – orbits around the earth anti-clockwise once a month. 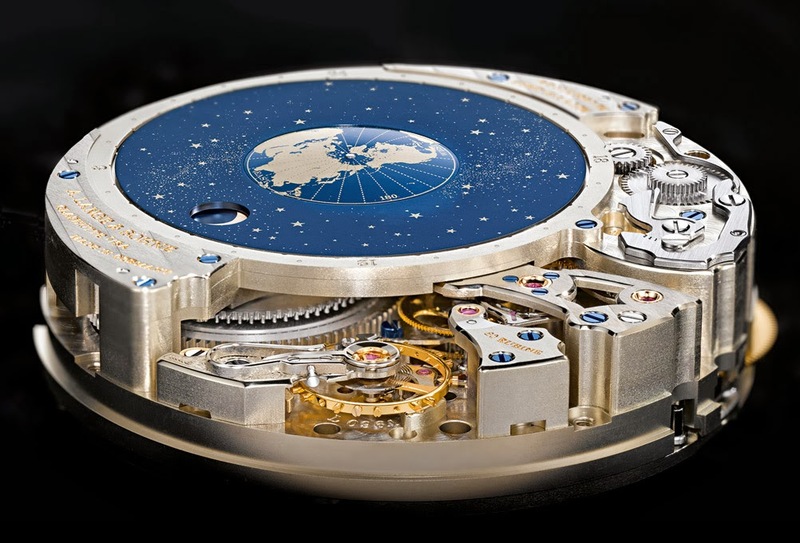 The mechanism reproduces the synodic month of 29 days, 12 hours, 44 minutes, and 3 seconds so precisely that it takes 1058 years before the display needs to be corrected by one day. Beneath it, the lunar disc rotates, featuring two round new moons. The progression of the moon phases can be observed through the aperture in the celestial disc. In the constellation view, the sun is represented by the balance. In the centre of the display, the earth rotates about its own axis once a day showing the daytime for the half that faces the sun (the balance) and the night-time for the other half. The peripheral 24-hour scale provides a time-of-day reference for the northern hemisphere. 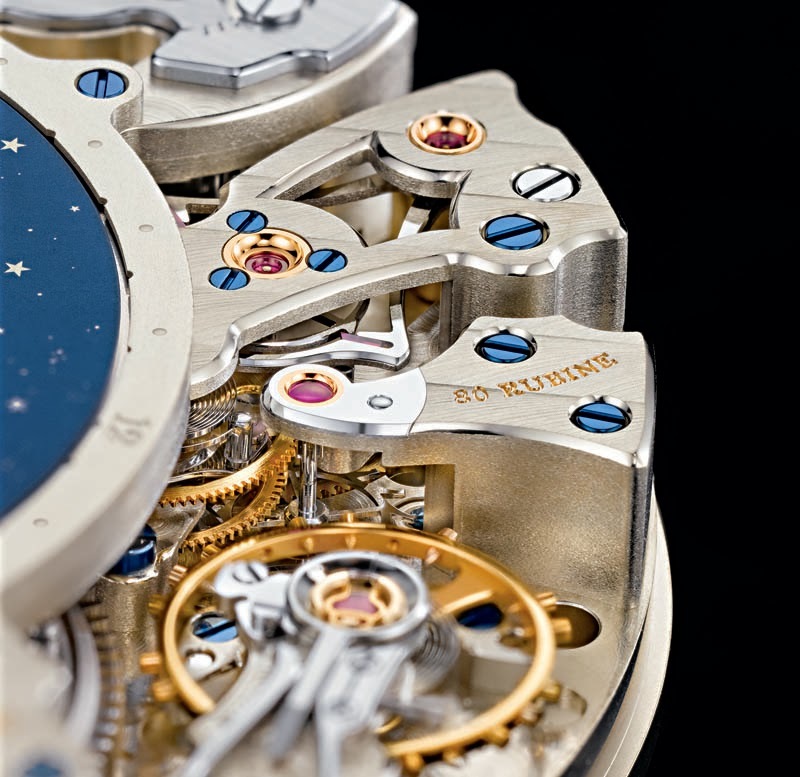 To achieve a vivid and aesthetically sophisticated image of the orbiting moon-phase display, they chose a special coating process. On the celestial disc, for example, interference effects absorb all of the non-blue colour spectra of the incident light. The result is a deep-blue surface studded with more than a thousand high-contrast, sharply contoured stars. 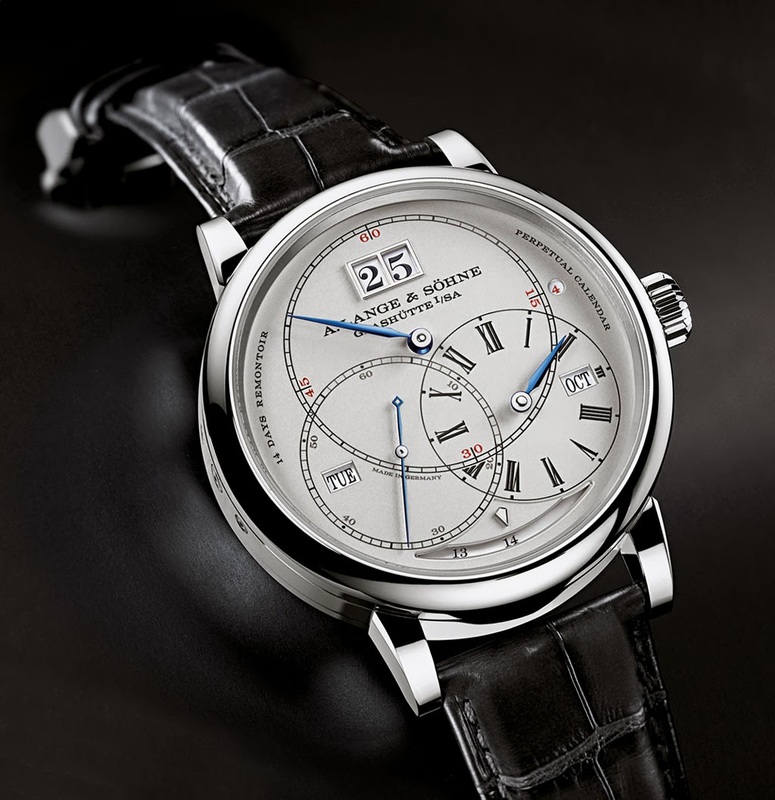 Thanks to the twin barrel, the Richard Lange Perpetual Calendar Terraluna offers a power reserve of 14 days. To keep the rate of the watch stable during such a long power-reserve period, a sophisticated constant-force escapement releases an identical portion of the available energy to the balance in ten-second intervals, thus assuring that the torque remains constant. The result is a constant amplitude and high rate accuracy from the first day to the last. The index-less oscillator of the in-house L096.1 manufacture calibre beats with a frequency of 21,600 semi-oscillations per hour. 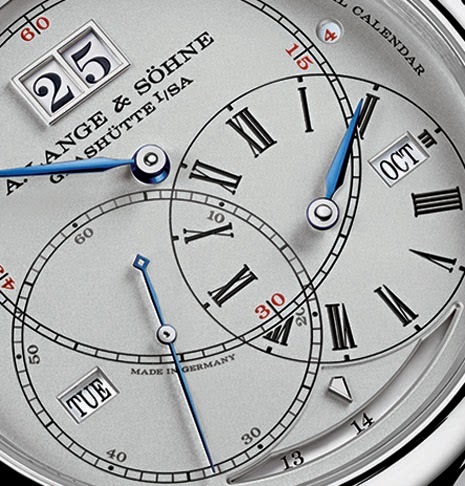 The movement is beautifully hand-decorated in the recognisable Lange-style. 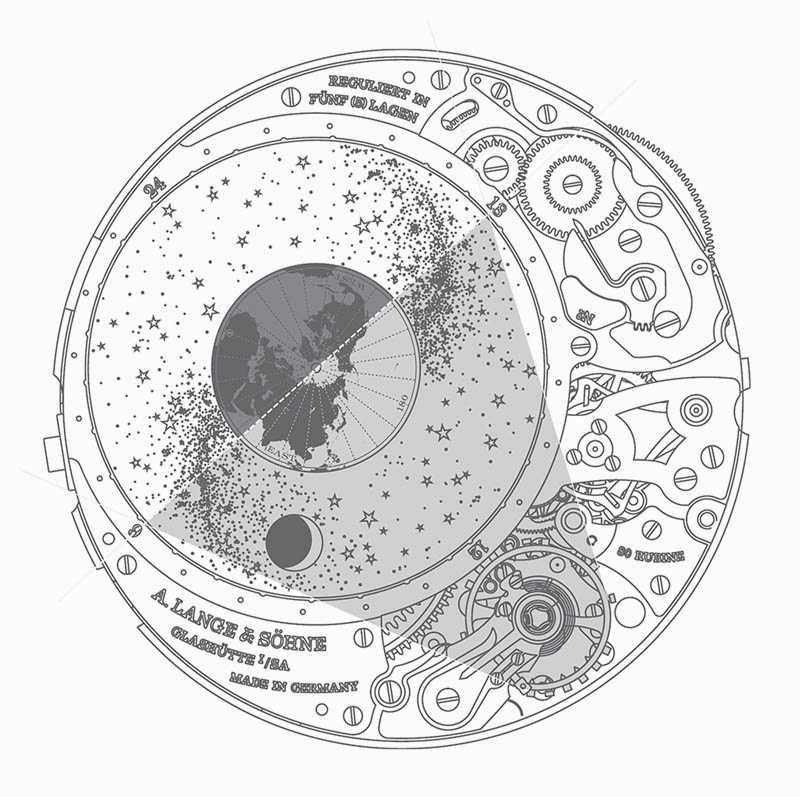 The A. Lange & Söhne Richard Lange Perpetual Calendar Terraluna is pretty large (the only regret we have) with a diameter of 45.5 mm and a thickness of 16.5 mm. The pink gold version (ref. 180.032) has a retail price of US$ 215.100. The white gold one (ref. 180.026) is US$ 216.400. Probably the most impressive new watch seen at the SIHH 2014, the new A. Lange & Söhne Richard Lange Perpetual Calendar Terraluna features an orbital moon-phase display, a perpetual calendar with the signature Lange outsize date, a power-reserve of 14 days, and a constant-force escapement. The pink gold version (ref. 180.032) has a retail price of US$ 215.100. The white gold one (ref. 180.026) is US$ 216.400.